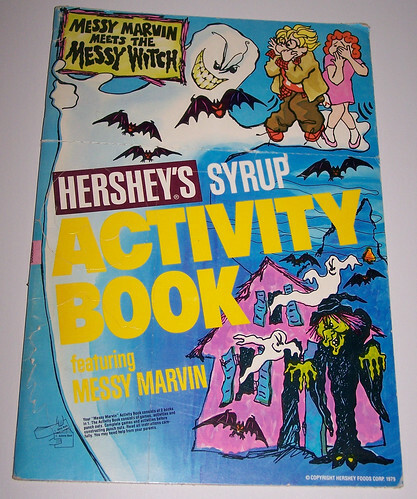 Hershey's Syrup was advertising back in the late 70's and early 80's that it was clean and easy to use the product, and had Messy Marvin demonstrate you can't screw up making chocolate milk. Marvin was played by Peter Billingsley, later of A Christmas Story fame. This is the cover of an activity book -- two books in one, actually. The top section is an illustrated story, which can tear off the activity portion (coloring, connect the dots, that sort of thing).